The Latest in Celebrity News, Red Carpet Moments, Viral Videos and Breaking Celeb Rumors! : Kelsnetwork Talks to Michelle Williams on Stroke! 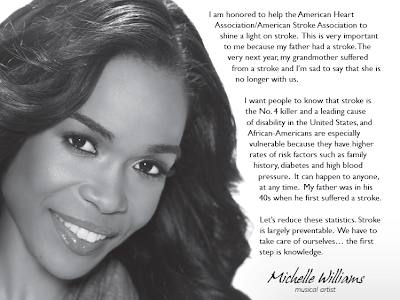 Kelsnetwork Talks to Michelle Williams on Stroke! Michelle: As an ambassador for Power2EndStroke I have to let you know that May is Stroke Awareness Month. Young people can have strokes too! Kelsnetwork : Really?I thought it was only old folks that got stroke. Michelle: I know a girl who wasn't even 20 years old when she had a stroke...my dad's 1st stroke was in his early 40's. Kelsnetwork: Thank you for enlightening us on stroke.... how is your dad now? Michelle : He's good...he still has some paralysis and can't talk...but he's fully aware and can understand what we say to him, etc! According to Michelle, her father had stroke in his early 40's and her grandmother died of stroke so she is using her status to educate people on stroke. We here at Kelsnetwork want to thank Michelle Williams for all her awareness programs(This is not the first). She has used her celebrity status to educate people on cancer and autism in the past. This post is dedicated to HelzWillRow82 ,a wonderful fan of Michelle Williams. Click here to find out more about the causes and symptoms of Stroke!